These famous faces hopped right off the screen and into real life! smile, frown, and feel every emotion in between with these soft foam emoji cubes from Learning Resources. 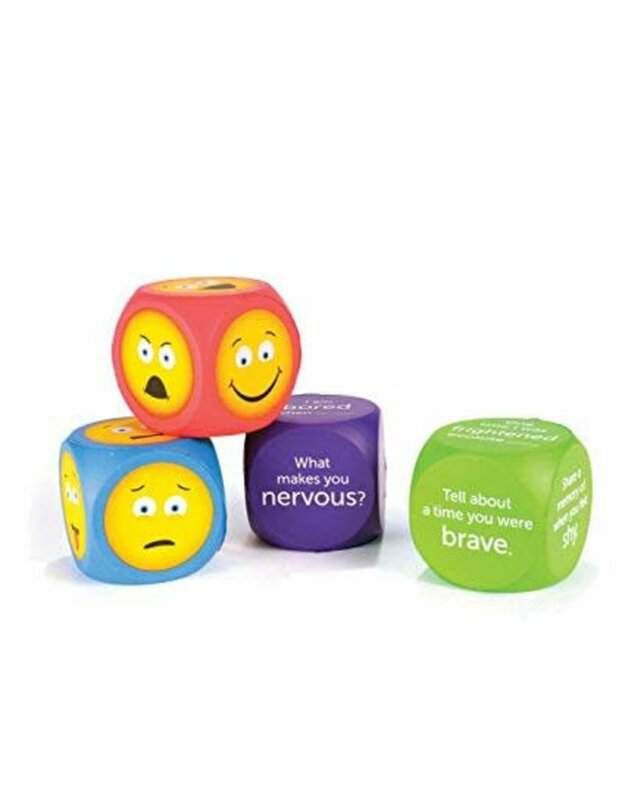 Based on the imagery of the popular mobile communication icons, this set of dice-style cubes comes with two cubes adorned with 12 different faces meant to represent common feelings and emotions, and two cubes filled with prompts and questions designed to get kids talking. These cubes offer plenty of opportunities for fundamental social learning-have kids roll the question cubes and answer the resulting prompt, or Let them roll the emoji cubes and discuss the feelings and emotions behind the faces that come up. The soft foam emoji cubes are also great for language and vocabulary lessons, and can help kids expand the ways in which the think about and communicate their inner feelings. Made of easy-to-clean soft foam. Includes four cubes: two with 12 emoji faces, and two with 12 prompts involving secondary emotions. Cubes measure 1⅝”. ages 3+.